I was given a great gift for Christmas – new soapmaking ingredients I haven’t used before. Among them were Cocoa Butter, Clary Sage Oil, Avocado Oil and Ginger Root Powder. 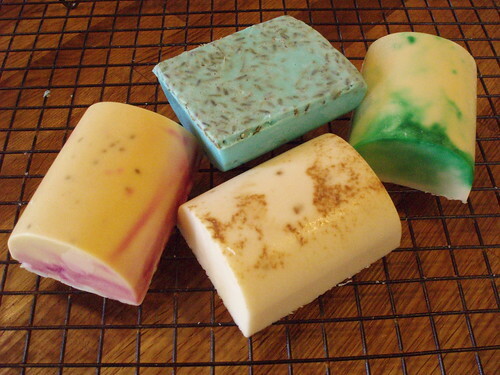 Since then, I’ve been wanting to experiment with some new soap mixtures but haven’t had much time until this last week. As a hobby, making soap is a great stress reliever. It’s a mixture of science, art and aromatherapy all in one. I had a pretty busy week and by Thursday night, I was ready to “degauss” (as my coworker and friend, Noah, likes to say!). So I popped open a beer (gasp! ), laid out all my supplies and spent an hour on the following creations. Click on the picture of the soap for notes on the ingredients. I finally watched “Fight Club“. Another friend at work, Michelle, loaned me her “Fight Club” DVD before Christmas. After a bit of prodding, I finally watched it yesterday. All in all, I liked it and thought it was a decent movie. The movie has a large following of fans that can probably add more to this analysis. For me, I now understand the Tyler Durden/soapmaking references. I’d say more but I’d be breaking the first rule of Fight Club. Want a bar of soap? Want a bar of soap? Leave a comment and be entered into my drawing! I don’t sell my soap. It make it, give some away and use most myself. I’m not making soap in large enough quantities to supply a lot of people but I’m going to try something new with this batch. Comment on this post by 7:00pm (Arizona time), Wednesday, January 28th, 2009 on why you want a bar of soap. The names of those who comment by this time will go into in a hat. After that, I will draw one name from that hat and award one of the bars of soap pictured above to the person whose name I draw. Comment all you like, but I’ll only put your name once in the hat. (Gotta be fair, right?) Make sure you put an email address I can get back to you with. I’ll only use that so I can ship you your free bar of soap – I’ll even pay for the postage! I’ll post the winner’s name by Friday, January 30th. Good luck!